According to BMI Research, the nation will increasingly emerge as a mining investment hot spot in Latin America thanks to a combination of revised regulatory framework, significant gold and copper reserves, and a policy of “inclusive agenda of development” expected to be carried over by the incoming President Lenin Moreno. The value of Ecuador's dawning mining industry is set to jump from $1.1 billion this year to $7.9 billion in 2021, according to BMI Research. “While left-wing candidate Lenin Moreno won the April presidential election over the traditionally more business -friendly centre-right candidate Guillermo Lasso, we expect the incoming administration to continue to support mining development, as initiated by Moreno's leftist predecessor Rafael Correa,” the analysts write. Under Correa, Ecuador relaxed the implementation of the 70% windfall tax on profits, now only applied after the firm has regained full capital investment and only if commodity prices reach pre-determined levels of $1,500 an ounce in the case of gold and $8,818 a tonne for copper. 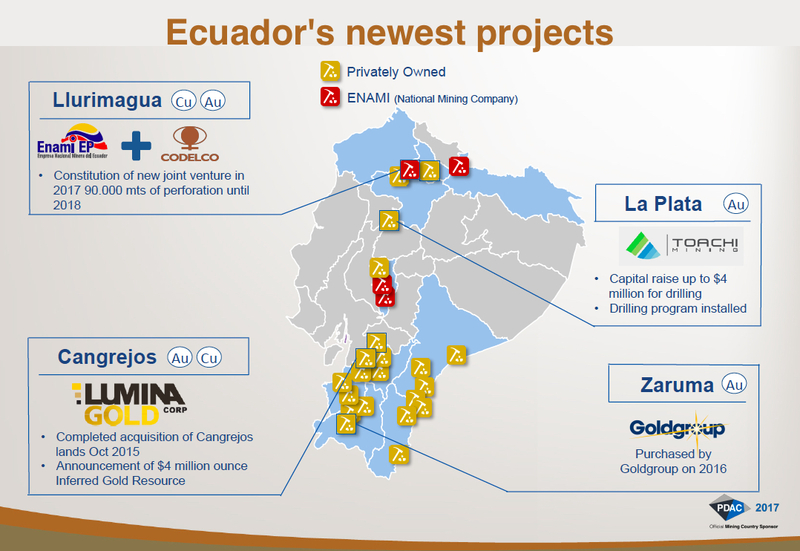 Another measure recently taken by Ecuador was the creation of a mining ministry. Before 2015, the oil and gas ministry regulated the activity and, as such, it was quite neglected, the country’s mining minister Javier Córdova told MINING.com last month. Thanks to those changes, the country now expects mining investments to increase 360% in the next four years compared to the period 2013-2016, totalling more than $4 billion. 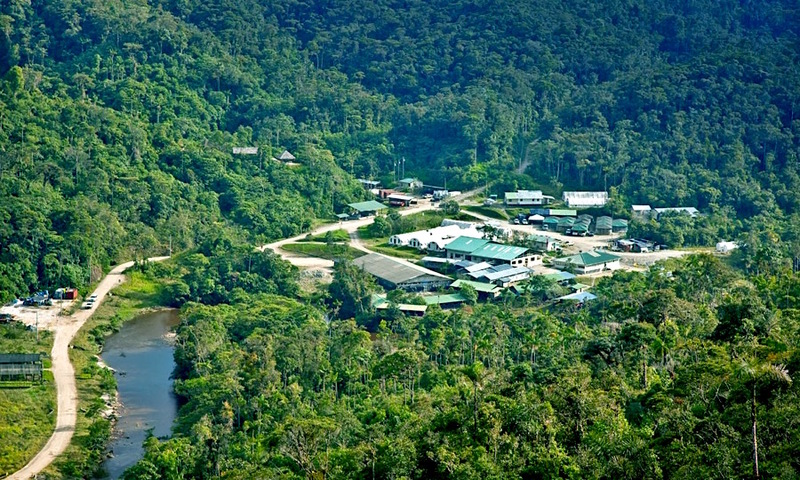 The most important of those projects, Córdova said, continues to be Fruta del Norte, now property of Lundin Gold (TSX:LUG), which the firm acquired it in 2015 and late last year reached a key agreement with authorities that includes an investment protection contract. The asset, discovered in 2006, is expected to generate 340,000 ounces of gold a year during its mine life. First production is expected in the first quarter of 2020, with full operations beginning in 2021. There also are other projects worth keeping an eye on it, two of which are being developed by Chinese companies — the large-scale Mirador copper mine, controlled by the CRRC-Tongguan consortium, and Río Blanco, also a copper project now operated by Junefield Mineral Resources. But is exploration activity what really is going to drive the nation's mining sector long-term growth, BMI says, adding there already are several potential projects on the go. In March, Canada-based Aurania Resources acquired EcuaSolidus, which owns 42 mineral exploration licences in the country’s southeast. And earlier this month, another Canadian firm — Cornerstone Capital Resources — announced a 51% earn-in agreement of the Bramaderos gold-copper deposit with Australian miner Avalon Minerals, provided the latter spends $1.5 million on exploration within the first year or $1.9 million before the third year. 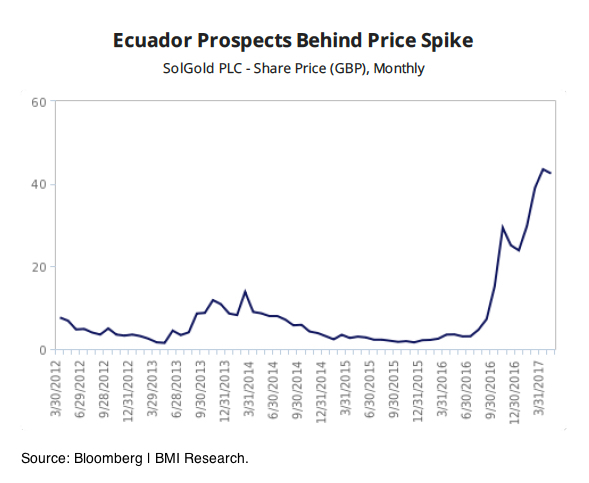 “While the majority of Ecuador's project pipeline remains at the exploration stage, meaning that production will not come online for a number of years, we expect improving copper and gold prices to support development,” the BMI Research's experts write. Currently, Ecuador’s mining sector employs 3,700 people, but the figure is estimated to rise to about 16,000 in the 2017-2020 period.